In this undated file photo provided by the U.S. 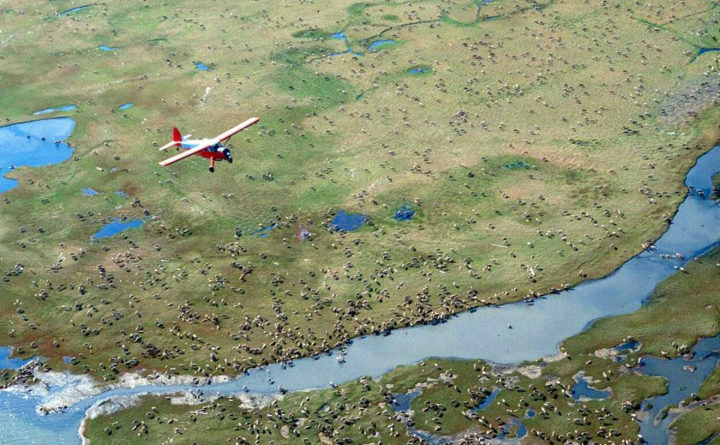 Fish and Wildlife Service, an airplane flies over caribou from the Porcupine Caribou Herd on the coastal plain of the Arctic National Wildlife Refuge in northeast Alaska. ANCHORAGE, Alaska — The Trump administration is aiming to open millions of acres of Alaska Arctic land for drilling that was protected under the Obama administration. The U.S. Department of the Interior began talks with state officials and the North Slope Borough, looking to update the 2013 management plan that kept drilling off about half of the National Petroleum Reserve-Alaska, the Anchorage Daily News reported this week. The vast reserve spans about 35,937 square miles, and is almost as large as the state of Maine. The potential area includes part of the Teshekpuk Lake Special Area, which was about doubled in size under the integrated activity plan and other protections. The area and nearby wetlands are considered vital for several animal species, including caribou, polar bears and migrating birds. The formal process to review and revise the plan has not started, said Joe Balash, the department’s assistant secretary for land and minerals management. Susan Culliney, policy director for Audubon Alaska, said the existing plan doesn’t need to be changed because it balances conservation and oil development. Environmental review and public comment will be critical for any revision to the plan, she said. “Audubon will certainly be there to offer science and data” to show why strong protections are warranted, she said. The borough wants the part of the protected lands with strong oil and gas potential to be opened up, Mayor Harry Brower Jr. said. Measures to protect wildlife and subsistence hunters can be implemented where needed. The size of the area that could open for drilling is uncertain and the proposal will be made with input from the stakeholders, Balash said.